Ah, yes. Today is Valentine's Day, and signs of it are all around us. The hotel lobby is filled with red valentines. The flower shops have heart-shaped floral arrangements, and you see heart-shaped balloons in shop windows. "It's only a gimmick of the florists to make more money," Mohammed explained yesterday. I find it sweet - a bit of my heritage, here in Egypt. We've been gone from home so long and experienced so much, it feels like we've been here a year. And it feels like we've known Mohammed for at least that long. Peter and I have discussed this "du" and "Sie" business and decided, since it bothers me so much to say "Sie", I might as well offer the familiar form to Mohammed. Besides, I'm the oldest one here anyway, and the woman. In Germany, the older person or the woman offers the "du" form to the younger. Today we're driving to Alexandria. Mohammed meets us in the morning, as usual. For the blog I've been calling him "Mohammed", but that's just the name I've given him for the sake of anonymity. Offline, we've been calling him by another name, which for the blog I'll call "Herr Seliman". As soon as we're all in the car, I tell him, "Look - I don't feel comfortable with this 'Noreen', 'Peter', or calling you 'Herr Seliman' one minute and 'Mohammed' the next. No more 'Sie', 'Du', 'Euch' and 'Ihnen', please." Without a pause, he pops out his first name, "Mohammed". Great! Now we're friends, on a "du" basis, just what the relationship feels like, at least for me. I feel much better with this, but I know I cause Peter to cringe sometimes because of my openness. He'd be happy to stay with "Sie". But how can I say "Sie" and talk about personal things? I do want to get to know Mohammed better. Egypt isn't just a land to be discovered through books for me, and he's a fine, interesting person, able to articulate about himself, his values, and his country. Still, I know Peter's much more comfortable maintaining a distance - he's much more reserved than I. Oh well, one of the reasons he married me was because of my openness. He's always said he loves how I can get people to talk. I also think Peter secretly likes the conversations I initiate. He often tells me how interesting life is with me. I feel the same with Peter. He knows more than anyone I know, and he's well informed about hundreds of subjects. He reads voraciously. We have wonderful discussions - he supplies the information and I supply the opinions. We drive along the desert highway to Alexandria, first passing through 6 October City. 6 October City is named after the 6 October War, also known as the Yom Kippur War, which took place in 1973, when Egypt and Syria declared war on Israel to reclaim land lost in the 1967 war. The initial attack took place on 6 October, the same day as Yom Kippur, a Jewish high holiday. It was also in the middle of Ramadan that year. Egypt and Syria lost the war, but it was still a proud time for Egypt because its soldiers fought so well and valiantly. Mohammed tells us that this city has over a million inhabitants, and is growing. It is a mega-sprawling suburban city, divided into one planned community, or compound, as they call it, after another. Each planned community has apartment buildings no higher than six stories, and villas. Each building is almost exactly the same as its neighbor, and this goes on for hundreds of meters. The houses are also practically identical in one community. The neighboring community has a different style for the villas, but each of these is, in turn, identical. We pass a community called "Dreamland" and notice that it has an amusement park. In the amusement park there are American hotels like the Hilton and fast food restaurants like McDonald's. Each community has its own sports center, and many of them have shopping malls. He shows us one in another community that has over 400 shops, including a giant superstore. I can imagine preferring living here to the chaos and pollution of Cairo, but now this strikes me as a community constructed by Disneyland. I keep waiting for the desert to show up, expecting to see nothing but sand, but we see only fruit orchards, pine tree farms, farms and vineyards almost all the way to Alexandria, about a three-hour drive north from Cairo. Mohammed tells us that wells which can be over hundreds of meters deep have been dug, right in the desert. Some of the water is brought up to the surface, creating cisterns. Hoses are connected to the cisterns, which run along the orchard or farm. These hoses have tiny holes in them to give the tree roots, or plants, just a few drops of water at a time. Tomato plants and cucumbers are watered in the same way. The plants are covered with plastic, creating long white rows of plastic. We see pink blossoming trees that we later learn are peach trees. It seems that almost anything can grow in this way. These orchards, farms and tree farms extend at least 70 kilometers from the highway in either direction. We stop at a rest stop not that much different from one in Europe. But all along the road there is the occasional speed bump or traffic control, where we have to stop. At these stop areas, people have set up improvised stands selling Coke, toys, and chocolate, or fruit. The stands are constructed of tawdry strips of fabric sloppily attached to wooden frames. Sometimes there's nothing more than a bunch of crates stacked up in a receding pile. We arrive in the outskirts of Alexandria. Mohammed has been raving about this city, so we're keen to see it. "It has a different atmosphere from Cairo. I love it! In the past, I used to come here on my own on the fast train, just to pick up the seaside city atmsphere, and I would walk for hours along the shore, or stroll through the city." Even now, he sometimes comes to Alexandria in the summer with his family for a beach holiday. What we initially see is a huge tenement city of almost 8 million inhabitants, on a par with New York City, at least with the number of inhabitants it has. 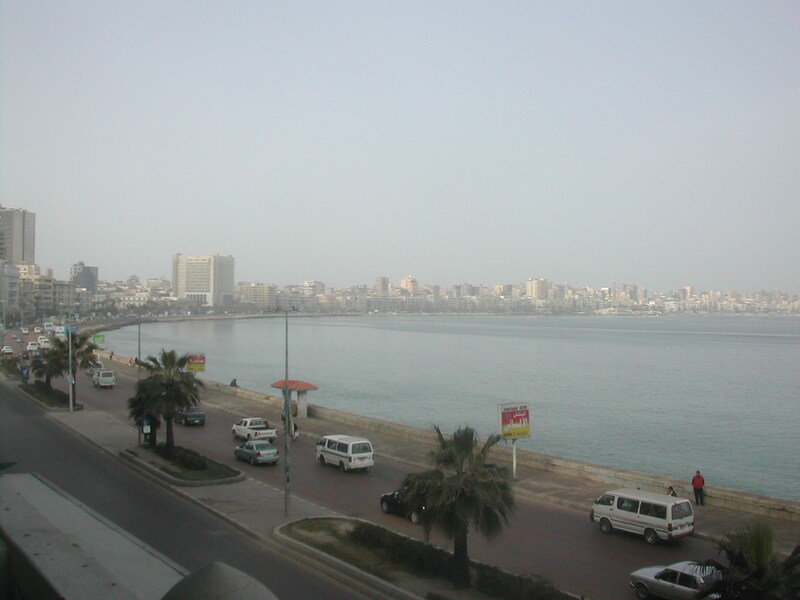 It is a madhouse, full of honking cars emitting stinky fumes all the way up to the coastline, which they call the Corniche, where our hotel is, and all along the coastline. The Corniche is one stinky, loud road extending all along the bay, turning what could be exquisitely beautiful into something stinky, polluted and noisy. It's cloudy and cold today. Mohammed says, "You'd get a much better impression if the sun were shining." I think, this is not a good place to recover from sinusitis. It's a good thing my sinuses are basically back to normal again. Even in the city center, the buildings are almost all gray and crumbling, making it feel like a city in the Communist bloc just after the change. Even the beautiful art deco ones, including the one we stay in, which has beautiful architecture from about 1900, with mosaics, and alternating brick and stone, hasn't been touched on the outside in over fifty years. And the streets are teeming with traffic and loud honking. Alexandria is one of the major port cities on the Mediterranean. It has a gorgeous bay. In the past, it attracted people from all the surrounding countries and beyond. 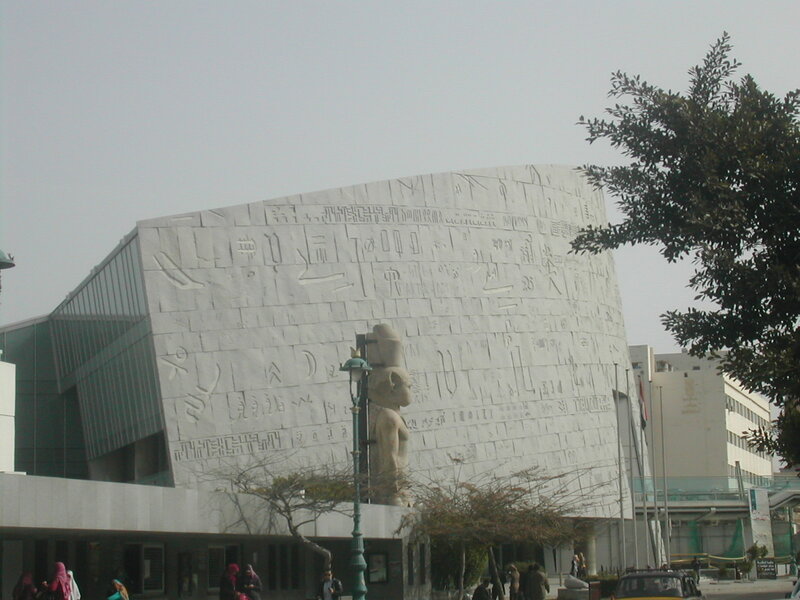 All throughout history, it was a city populated by foreigners and native Egyptians living together, creating a vibrant mix. There were Jews, Italians, French, British, Lebanese, and Greeks all calling Alexandria their home. Then in the 1950s, Nasser expelled the French, the British, and many of the Jews from Egypt. Within a few years, the entire character of Alexandria had changed from a bustling international community to a purely Egyptian city. When we comment about the crumbling, decayed buildings, Mohammed repeats what he had already told our group in Cairo in October. President Nasser, infatuated with many socialist ideas, decided to introduce rent control. 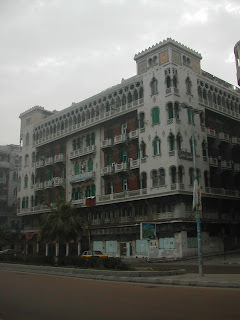 This affected all the buildings in Cairo and Alexandria. Landlords were forced to stablilize the rents in perpetuity. This meant that their profits were soon nonexistent, and they had no income to invest in building improvements. But first of all we visit the library. It is magnificent! Once an equally magnificent ancient library was here, but it burnt down over 2,000 years ago. It's been rebuilt, and is a truly amazing building. It is beautiful to look at, built in the shape of a disk, seven stories high. There is special stone or special holes built into the stone on the inside to absorb much of the sound. And the library is seven stories high, each story receding a bit. There's a huge computer area where people can hook in their laptops or use theirs, to do research. We look at the people working, and it is very quiet. 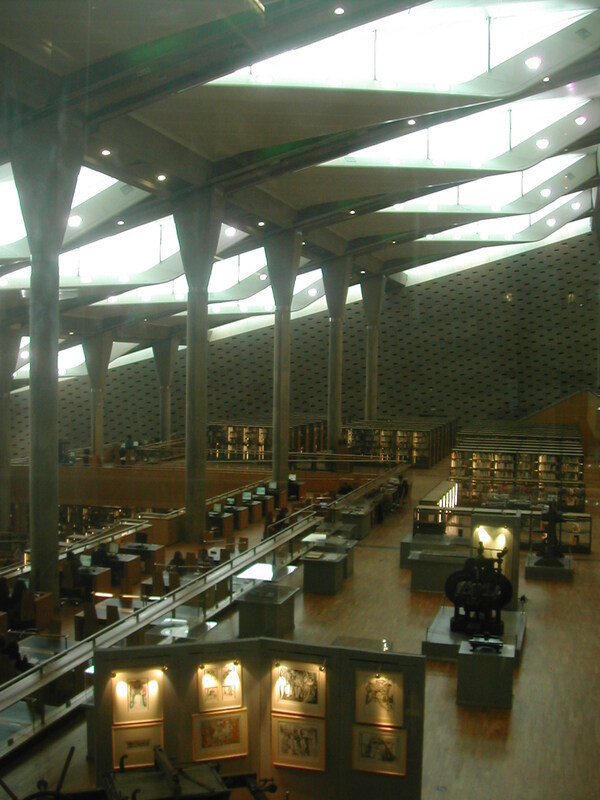 The bibliotheca is a complex of buildings, including a planetarium. We have a guided tour in English, but Mohammed also points out things like the facade of the building, which contains script carved into the stone. Every known written language of the world is represented. We enter a room with exhibits of the film maker, Shadi Abdel Salam. He made costumes, sets for films and even directed several movies, including "The Night of Counting the Years" (the original "The Mummy"). Mohammed says we have to try and see it. Then onto our hotel. The building is faded glory, now old and dusty. But the hotel, on the third floor, is attractive. Our room has a bathroom built into the room with a threshhold and sliding doors. In the afternoon, Peter takes a nap, Mohammed is off visiting an archaeological site, and I go exploring, venturing out on my own. As I walk, I try to imagine an Alexandria sixty years ago, but it is difficult. Signs are practically nonexistent. Still, I find the fabled "Delices" cafe, famous for its pastries, and treat myself to delicious chocolate mousse cake and tea. I also find a bookstore Peter is interested in, and buy him a newspaper. I feel proud of myself, getting around an Egyptian city entirely alone now, as a woman. It feels OK - I think it's not seen as improper for a woman to be out on her own during the day. In the evening, we drive to Kadoura, a wonderful seafood restaurant. I don't know if I've ever had better fish, all caught locally, from the Mediterranean. The Egyptian way to eat fish in a restaurant is to go to the fish display, where everything is on ice, and pick out the fish you want to eat. We eat the biggest jumbo shrimp I've ever seen, a shrimp-eating fish called red mullet, and more. Mohammed says that the red mullet is pink because it eats so much shrimp. There's lots of garlic and lemon in the fish, and everything is served with fried rice with onions. We have cofee at the Athinos café, full of the old style, and then walk around, windowshopping. The shops are still open at 11 pm. Yes, at night Alexandria is really charming. The city is full of life. I see what Mohammed means. There is a certain romance about it. When we return, Peter finds a Valentine's card on the bed. Giving Valentine's cards is a habit I brought from America to Germany, so it's natural for me to remember romance here in Egypt.